I think Spring might be my favourite time of year. All the plants start to come back to life, I can finally plant my garden and the sun starts to shine with a bit more warmth. But I think what I like most about spring is that after several months of the same winter vegetables, suddenly the selection at the market begins to change. Regardless of the weather, you know it’s spring when fresh rhubarb starts making an appearance. This past week we were celebrating my uncle-in-laws 65th birthday. I was asked to bring an appetizer and I thought it was only right to feature some of this wonderful, fresh, spring produce. Strawberries and rhubarb are a traditional combination and I thought, together, they would be delightful on top of baked brie. 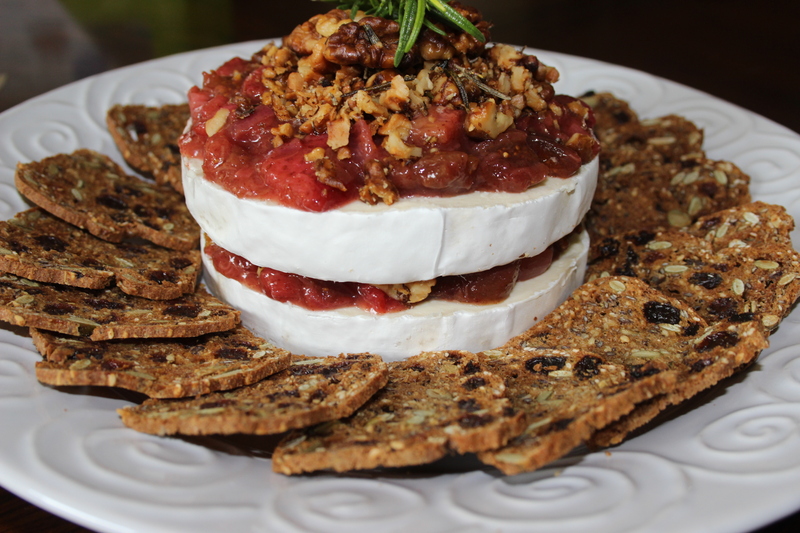 So here it is, my recipe for Baked brie with strawberry rhubarb jam (and fried walnuts). The picture I’ve included was taken before it was baked. I thought it looked a little like a birthday cake, which seemed pretty fitting given the occasion this was made for. Just a warning: the jam itself is highly addictive and delicious and there’s absolutely no shame in eating it straight from the pot ;). Enjoy! Heat the olive oil in a sauce pan over medium heat. Add the shallots and saute for a minute or two, until beginning to soften. Add the Rhubarb and figs and cook for about 2 minutes before adding the strawberries. Reduce the heat to low. Stir in the cinnamon and honey and continue to simmer for about 5 minutes until thickened. Set aside. In a small frying, heat the oil and rosemary together over low to medium heat. Add the walnuts and cook for 5 to 10 minutes until the walnuts are golden. Remove the walnuts from the pan and place them on paper towels to absorb the excess oil. Set aside. Slice the brie in half horizontally. Place one half, cut side up, on an oven proof dish. Spread half the jam mixture over top, then place the second half of the brie, cut side up, on top. Spread the remaining jam over the brie and top with the fried walnuts. Bake for 12-15 minutes. Serve with crackers or a sliced baguette. Baked brie is totally my jam right now (get it? 😉 ) This seriously looks great! This looks awesome, I love your presentation- I can see this getting devoured by friends, I’ll have to make it for sure! Thanks Jhuls! I’m not very good at gardening either, but I like to try planting a few new things each year to see what works, lol. You should definitely try brie cheese. It’s delicious and when it’s baked, it gets so wonderfully creamy. Wow! This sounds beyond amazing! So pinning this! Visiting from Real Food Friday. I love baked brie! If you love healthy recipes check out my redesigned blog, hungrymountaineer.com, we even have a FB page now! This sounds fabulous and I love all those healthy ingredients. Spring is a wonderful time of the year and I can remember when I was a child my Mother grew rhubarb (and still does) and I always looked forward to my Mom making rhubarb pie & just plain rhubarb sauce. Thanks for sharing on Real Food Fridays. Pinned & twitted. Thank you so much 🙂 Mmmm…fresh baked rhubarb pie would be amazing right now, lol. This is great party food! Looks amazing:) Delish!!! Great appetizer! I love strawberry rhubarb but have never paired it with cheese. Brilliant! Thanks Julie. It was really yummy! In this moment I cannot imagine something more yummy than your plate… I’m used to bake brie, but I never thought to serve it with strawberries and rhubarb (and figs)! What a idea you had! This sounds amazing! There’s nothing quite like a baked brie, and your jam sounds like the perfect accompaniment (try wrapping it in puff pastry!!). Happy FF#65 to you. Thank you so much, Cyndee 🙂 It’s always a treat to see all the new recipes posted each week. Just a note to let you know that I have chosen your post as one of my features for this weeks Real Food Fridays blog hop that goes live Thursday @ 7pm EST. Thanks for sharing on Real Food Fridays! Wow! Thank you so much, Marla!